Evolution and Trajan Steel Cutting Carbide Circular Saws offer the highest quality of industrial metal cutting machines in The USA. When you need to cut steel, our machines can cut cold, with no coolant. Because the steel is cold it can be picked up and worked with immediately after cutting. 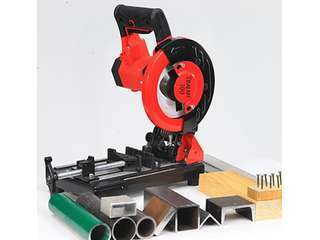 3 ⅛" x 4 ⅜"
3 ¾" x 7 ¼"
Now You Can Cut Steel, Aluminum & Wood With One Saw & One Blade! One Qsaw blade cuts everything! Industrial gearbox, which reduces motor stresses, improving performance and durability. Fast action swivel clamp with solid cast jaws enables cuts to be made from 0 - 45°. Portable and easy to transport, taking up little space and offers huge performance. Superior performance, the Q700 outperforms normal cutting saws. When cutting Steel. Sawblade.com introduces the next generation of performance cutting; The Trajan Q700 can cut almost any material up to 2". This Carbide Saw will cut steel without excessive heat, and now cutting box tubing or angle iron has never been easier. The Q700 also comes with a miter to handle your angle cutting needs as well. This machine comes with a Qsaw carbide blade that last up to 20 times longer than abrasive blades. This powerful Steel cutting circular saw tackles even the most demanding of tasks with incredible cutting capabilities through tough applications. The powerful 1750W motor allows this machine to breeze through mild Steel without heat build-up, burrs or the use of coolant. Features include a useful laser guide to assist with accurate cutting and the bevel tilt enhances the versatility of the saw. Cut Stainless Steel, Aluminum and Wood with the correct, specialty blade attached. The STEEL SAW 230 is powerful and strong, yet compact and portable. Carrying Case, 9" Steel Cutting Blade, Side Handle, Wrench, Fence Guide, Spare Carbon Brush Set, 2 Batteries, Safety Goggles, Ear Plugs, Manual. 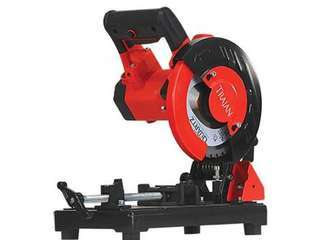 A circular chop saw is a saw with a circular blade that can cut wood, plastic, and metal. It is easy to operate and move around. Circular chop saws can definitely provide advantages in speed, efficiency, quality of the cut and the saw should be a staple in most manufacturing operations. It can even have a place in your home shop. 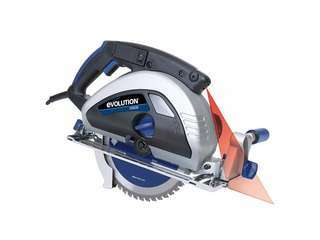 A circular chop saw has great versatility and can be equipped with a wide variety of blades. This means it can cut, finish, or grind. One of the biggest advantages of using circular chop saws is how portable they are, even the industrial sized ones. With a generator, you can take a circular chop saw to your work site and quickly cut materials like pipes and building materials. This gives you greater efficiency because you can make more cuts per hour, easily cutting smaller pieces. Furthermore, circular chop saws are typically able to produce pieces that can be welded immediately after being cut with minimal finishing/filing. Another advantage of the circular chop saw is its versatility. It can cut many different materials and be fitted with different blades, enabling the operator to specialize the chop saw based on the material to be cut. It is often used on job sites because it can easily cut at a 45-degree angle. The circular chop saw also requires minimal maintenance. It does need to be cleaned regularly, especially where the chips collect in the pan. Carbide chop saws are very reliable, and don't tend to gum up. This lets you cut longer and more often. The circular chop saw should be on every workshop's list. 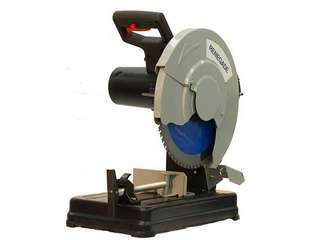 If you have any questions about circular saws, or would like to purchase one, contact sawblade.com today.